How to choose a trekking tour in Nepal? 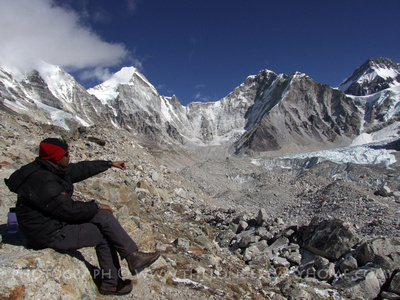 One of the most popular questions I get asked is where to find a trekking tour agency in Nepal. The second question is why are they so expensive? I've spent a lot of time going through the following online agencies and tour operators selecting the best trekking tours both in terms of experience and price. I've listed and given a summary on each one here to help give you the pro's and con's before selecting one. Do please read my pages on trekking in Nepal, my list of treks in Nepal and how to choose a trekking guide in Nepal - they contain very important information that will help you. The following lists are from a variety of trekking tour operators, agencies and organizations. I've spent a lot of time choosing the best deals they have and have provided a pro and con summary of each to help you choose. Prices are subject to change and often include discounts so do check back here regularly! Trekking tours with Viator: This is an internationally recognized company with excellent customer service. They handle everything for you from start to finish. Their selection of treks and activities in Nepal cover a lot of shorter treks beyond what's listed here. They do come at a premium cost though! Pros: Have a very good reputation. Excellent customer service. Huge range of not just treks but also other activities in Nepal. Cons: Their prices can be higher than others. View a full range of treks by TourRadar + Discounts! Pros: A wide range of trekking tours from a variety of companies eg. G Adventures, Intrepid & local etc,. Prices are competitive with budget treks listed. 5% discount for booking via the links above. Cons: All treks are dealt with by 3rd parties. Nepal trekking tours with Intrepid: A large internationally based trekking tour company. The range of treks offered are limited but very reliable. Pros: Strong reputation. Good customer service. Cons: High prices. Internationally based company. Often bundle you in with a group. Nepal trekking tours with Get Your Guide: Offering locally sourced trekking agencies keeps the cost of trekking packages low here. New treks often appear frequently so do check back here to see if there's anything new. Pros: Costs are relatively lower than other online agencies. Cons: Communication issues with trekking companies. Low selection of treks. Do be extremely cautious with online forums or sites listing people that are looking to join up and share costs with other trekkers. These sites are completely unregulated and are often filled with very dubious people from all walks of life. Some are predators while others are individuals from tour companies trying to bring in more people with false promises that usually end in bad treks or last minute cancellations. These sites look great on the outside but I've come across many disappointed people and sadly some very serious situations. Yes, there are some genuine people out there, but unfortunately it's not possible to vet them. These days there are dedicated con-artists well adapted at falsifying online identities just to make a buck. If you really are wanting to meet up with others to trek in a group the best option is to wait until you arrive in Nepal and meet people at a popular guesthouse or hostel. It's easier than it seems and you at least get to meet them in person first. Another option is to get your own guide and ask them if they have some others around the same date and if they'd be interested in joining in. For more, do read my guide on traveling solo in Nepal. The final option open to you is to hire your own guide in Nepal either online or when you get there. Do please refer to my page on how to hire a guide in Nepal for more information. If you'd like to hire the guide I used in Nepal then do feel free to contact me. However, I would appreciate it if you bought my guidebook on trekking in Nepal. My guides details and a host of other local trekking agencies along with all their contact details and maps are listed in it. If you find all of the options above overwhelming then I also offer a find a local guide service where I use my extensive list of local guides and find you the best guide and price for your trek.. The benefit here is you are using trusted well reviewed local guides, you can customize your own trek and I will get you the best price. 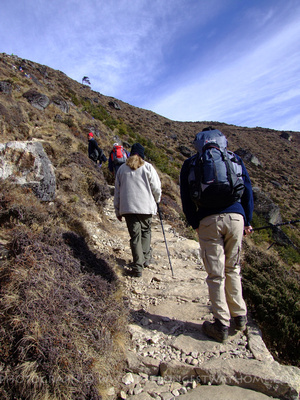 Get your own travel insurance specifically for trekking! No matter what option you choose to go trekking in Nepal I can't emphasise enough how important it is to have the right travel insurance for trekking in Nepal. It is essential your travel insurance policy covers you up to the altitude you are trekking to. Many don't! For more (and a solution), please read page on travel insurance for trekking in Nepal.